Known as shinrin-yoku, it literally means "taking in the forest atmosphere." In Japanese, it’s called “shinrin-yoku,” which translates into “forest bathing,” and no, it doesn’t involve getting naked or water. If you’re still interested, “forest bathing,” or taking in the forest atmosphere, is a decades-old Japanese tradition catching on in the U.S. It’s an increasingly popular health habit backed by quite a good deal of scientific evidence; including the ability of the phytochemicals in trees to fight disease. But, it’s not the same as taking a hike. “It’s more about being here than it is about getting there,” said Amos Clifford, who founded the Association of Nature and Forest Therapy Guides and Programs. A wilderness guide, therapist and Zen practioner, Clifford has trained about 600 forest therapy guides around the world. Clifford started his career in 1972 as a wilderness guide and quickly began working with troubled teens, introducing them to nature. Thursday, he told NBC7 he started spreading the word about the benefits of "forest bathing" after asking his higher power how he could do the most good for the most people with the rest of his time here on earth. The answer that came back from the universe was to introduce as many people as possible to the practice of forest bathing and forest therapy, he said. He estimates the number of people who have tried forest bathing in the U.S. is in the tens of thousands. The idea is to contemplate the beauty of nature with all the senses on a slow, and mindful walk through the woods. Amos said the goal is to "experience the ways we are in relationship with nature, and how these relationships support well-being"
“If I was guiding you on a forest therapy walk, in three hours, we would probably not go more than 300 yards,” Clifford said. “And you would be completely engaged for that entire time." Kaiser Permanente's Dr. Heidi Meyer is certified in integrative medicine, a type of medicine that embraces all healing modalities that are safe. She said the health benefits of being in green spaces is well-documented and evidenced in science. "Your immune system is absolutely more effective after you’ve been in a green space," said Dr. Meyer. "We know that the air in a green space is actually physically different than the air in an urban nongreen space." Meyer said natural killer cells, which are cells able to kill cancerous cells, are more effective after a week in the forest, according to Japanese studies. "But, do you really need a scientist to tell you a walk in the woods feels good?“ she added. 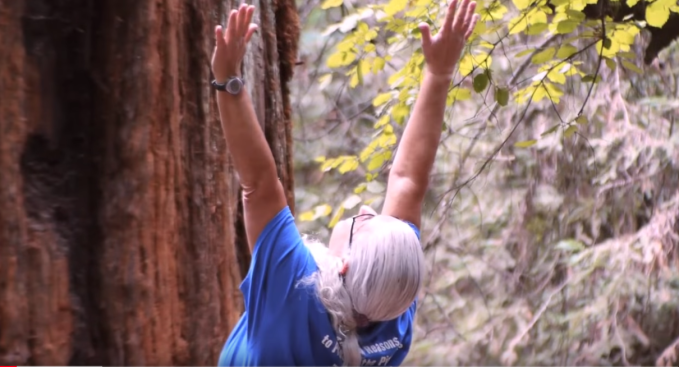 Jessica Geiszler, the marketing and public outreach manager for San Diego County Department of Parks and Recreation, said our region has many places to enjoy forest bathing. She mentioned the William Heise County Park in Julian, the Dos Picos County Park in Ramona, and Lake Morena County Park in Campo as great places to start. Geiszler said she's noticed even when people are enjoying the outdoors, they're not always connecting with it. "You see a lot of people with their headphones on and they’re looking at their cell phone, and they have sort of a techy park experience," Geiszler said. "What’s neat about forest bathing is that you’re asking people to put down those mobile devices, and you’re forcing them to listen to nature and just to really appreciate where they’re standing," she said.